Marine Mammals of the World Jefferson Thomas A., Webber Marc A., Pitman Robert L.
Auteurs : Jefferson Thomas A., Webber Marc A., Pitman Robert L.
This new edition of Marine Mammals of the World describes and illustrates newly discovered and rarely photographed species, making it the most comprehensive and up-to-date identification guide available. This edition continues to meet the research-focused needs of marine biologists and conservation biologists by providing a tremendous influx of new photos, taking advantage of advances in digital and auto-focusing photography, and the emergence of marine mammal studies and "whalewatching" around the world. 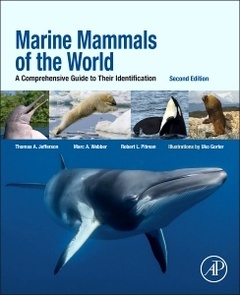 The book encompasses cetacean, pinniped, and sirenian species, as well as extinct species, and describes basic biology and taxonomic groupings of marine mammals. biology and taxonomy of small cetaceans, and their effective conservation. Maritime National Wildlife Refuge which is based in Homer, Alaska. and systematics of killer whales in Antarctica and Australia.